What do you think of the title, particularly as it relates to the end of the book? Was it a “good” goodbye, do you think? What do you think about Rory and Arden’s relationship? To what do you attribute the initial rift between them? Compare and contrast Natalie and Gabrielle’s parenting styles. What are their strengths and weaknesses? How are Theo and Vince different? In what ways are they similar? What do you think Natalie’s life would be like now if she had gone to Paris with Vince? The first thing you should know is that everyone lies. The second thing is that it matters.These words open the novel. From whose point of view do you think this sentiment comes? Discuss some of the lies that are told throughout the novel. Whose lies matter the most, and why? Is there any one event that, if it hadn’t happened, might have changed the outcome of the novel? Arden is a victim of peer pressure during high school. Was there anything in particular about her that made her susceptible to this influence? How could this bullying have been avoided? The parents of both girls need to make a horrible decision at the end of the book. What would you have done in their position? Rory and Arden are as close as sisters: they look alike, think alike, and attend the same schools. But in what crucial ways are they different? What are some of their other similarities? 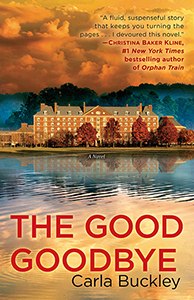 No one is entirely innocent in this novel, but is there any character you hold more responsible than others for the events that unfold? Discuss the different—and sometimes competing—motivations that compel Arden, Rory, and Natalie throughout the novel. Parental pressure and the need to achieve have a big impact on both Rory and Arden. How could their parents have handled things differently? What could the girls have done to mitigate some of these stressors? If you are a parent, did this novel cause you to reevaluate your parenting style? If you are a teen or young adult, did this influence the way you want to interact with your parents? What does it mean to be a “good” daughter, mother, or friend?